What is Narendra Modi’s biggest electoral success during the current term as prime minister? At first blush, most would say the Uttar Pradesh victory. That would be looking at the obvious (UP is the heart of the Hindi heartland) and at mere numbers (it has the maximum Lok Sabha seats). Yes, it was a tough fight, it came past the mid-way mark of his term, and regaining the state with mammoth majority against many odds was the watershed event between 2014 and 2019. A future historian, however, may consider the BJP’s silent march in the northeast as Modi’s most substantial triumph. Historically, in the Sangh Parivar’s vision of the nationhood, three regions figured as critical components. They were Jammu and Kashmir, the northeast and Goa (before its integration into Indian union), as they defied its concept of nation. After Goa became part of India, the other two continued to remain challenging for the saffron brotherhood to get a toehold. Given their demographical composition that militates against the ideological predilection of the Sangh Parivar, any assumption that the northeast and Jammu and Kashmir would ever cosy up to it seemed outlandish, if not impossible altogether. But the recent results in the northeast prove beyond doubt that politics is indeed an art of making possible what is perceived to be impossible. Of course, each of the three states that went to polls earlier this year – Tripura, Meghalaya and Nagaland – offer different backstories for the BJP’s advent to power. In two of them, the party has come to power thanks to a more popular local ally. But in Tripura, it not only won the clear mandate on its own, it also scripted a rare instance of a state taking a 180-degree turn, from the Left to the Right – something that West Bengal or Kerala has neither witnessed nor likely to now. 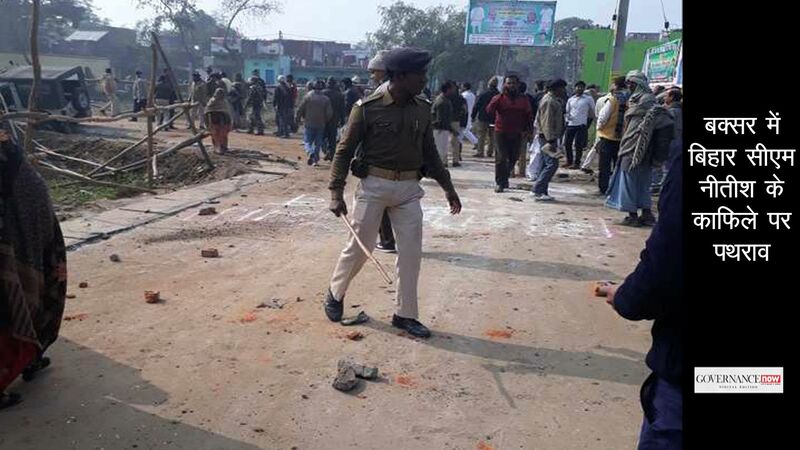 If India ever had a Berlin Wall moment, it was in Tripura this month. When the BJP came to power with Atal Bihari Vajpayee as prime minister, the Sangh Parivar did set its eyes on the northeast – a region whose ties with the ‘mainland’ are often tenuous in popular imagination in the rest of the country. The government set up a ministry dedicated to the region. Not much, however, came of the effort. On the contrary, the abduction of four RSS pracharaks from Tripura and their killing across the border in 2001 left the Sangh fuming – more so at the government’s inability to intervene. On top of that, there were allegations, mainly from Marxists, of the BJP taking the shortcut of hatred to make inroads. Ironically, the BJP has finally won in Tripura without playing the communal card. Tripura, unlike UP, was one state where the BJP’s diehard fans too would have had difficulty in 2014 in dreaming a win. 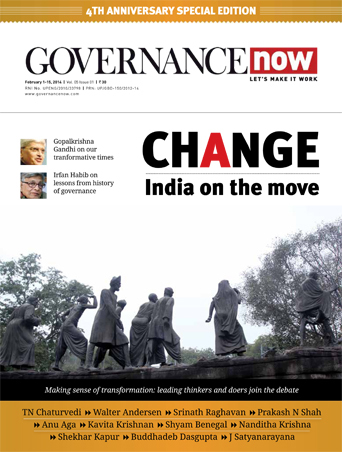 Even in the fourth year of his term, Modi has been able to counter the emerging signs of disaffection elsewhere and win in this state purely on the promise of change and of improved economic prospects. 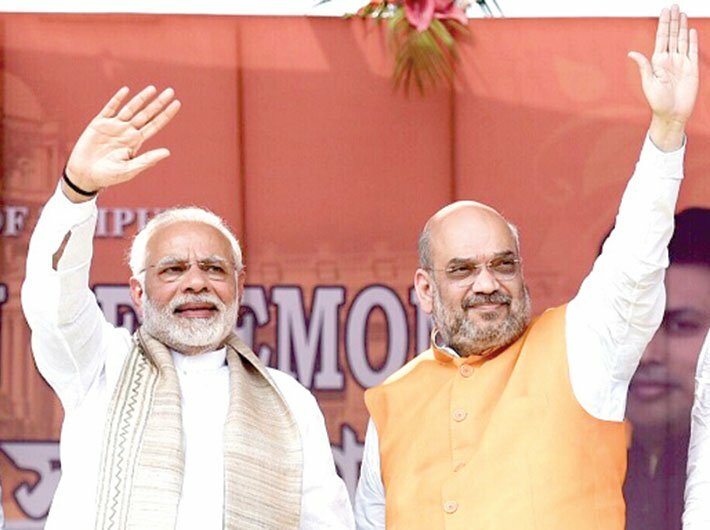 With the latest round of elections, Modi, accompanied by party president Amit Shah, has put 21 out of 29 states under the BJP’s belt, directly or in alliance. For a party the international media unfailing describes as the Hindu nationalist party, the surprising part is that these 29 include Jammu and Kashmir, with a Muslim-majority region, and Nagaland, a Christian-majority state. In other words, Modi has achieved in less than four years what RSS was only dreaming about for decades – and that too through full democratic means. It is a cliché to compare Modi with Indira at the peak of her popularity and by extension the BJP with the Congress of the 1970s. What is missing in that analogy is the ideological factor. Modi does not have the luxury of a centrist ideology which can be flexibly interpreted to suit every need. He has kept his Sangh upbringing upfront, and yet he has found a way – through a curious mixture of promise and performance, of poll tactics and pure politics – to make the party not only acceptable but preferable in the most unlikely places. The analogy with the Congress might be faulty but it can serve as a warning. The BJP is likely to badly need it in the year ahead. As it goes on to plant its flag in new and newer territories, it also has a hard time retaining the old ones. In Gujarat, the long years of incumbency brought it perilously close to the simple majority mark. But the states going to polls now, especially Rajasthan and Madhya Pradesh, not to mention Karnataka, can reverse the gains. Taking by-poll results as early straws in the winds, disaffection is setting in and people in states with long record of BJP rule are not going to be entranced by promises. For Modi, it will be tough luck if the victory march in the states is stalled just right before his big test of the Lok Sabha elections.